LunchBots Trio Stainless Steel Food Containers feature three compartments for balanced snacks: grapes, cheese and crackers; sushi, edamame and carrots; pasta, chicken and cherry tomatoes—the combinations are endless! 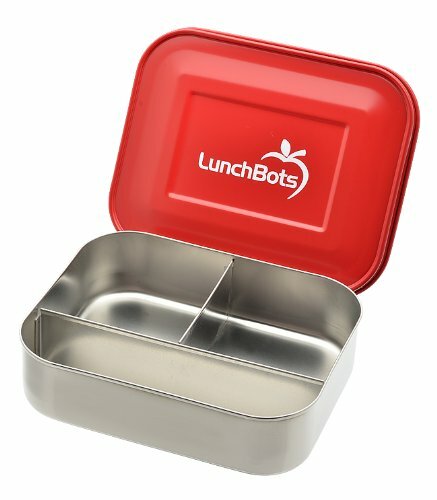 Whatever you pack, LunchBots make meals more appetizing, helping ensure your food containers return home empty. To clean, simply handwash the blue lid and place the base in the dishwasher. Won't stain or rust. LunchBots Trio Stainless Steel Food Containers feature three compartments for balanced snacks: grapes, cheese and crackers; sushi, edamame and carrots; pasta, chicken and cherry tomatoes - the combinations are endless! Whatever you pack, LunchBots make meals more appetizing, helping ensure your food containers return home empty. Made of the highest quality 18/8 stainless steel, LunchBots Trio food containers are durable and free of plastic and BPA. To clean, simply handwash the red lid and place the base in the dishwasher.